Help - we painted an accent wall red, the other walls are sort of sand (a little tan looking). The furniture is green and red and sand stripe. My husband said the curtain should be red too and I said that would be too much red in the room. The dining room which you can see right into has the top half of the wall red and the bottom sand. The furniture in the dining room is black and walnut. I feel the rooms are getting too dark - help is needed fast! I am getting so stressed out over this. My husband and I can't seem to agree on anything. I love red but from what you describe, I would say you have enough. I agree with you that red curtains could make the rooms look too dark and personally I would want to lighten the room. 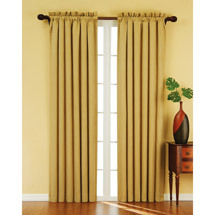 I suggest you go for a pale gold, or light sand color for your curtains and also I would recommend you try to get something without a pattern. If you can get a few plain sofa pillows in the same fabric too then so much the better. It is all about balance really. If you were having a hot and spicy curry for dinner you would probably want to balance all that flavour with some plain rice. Sounds to me like you have a lovely tasty casserole going on in your home and now it's time to serve it up with some mashed potato!